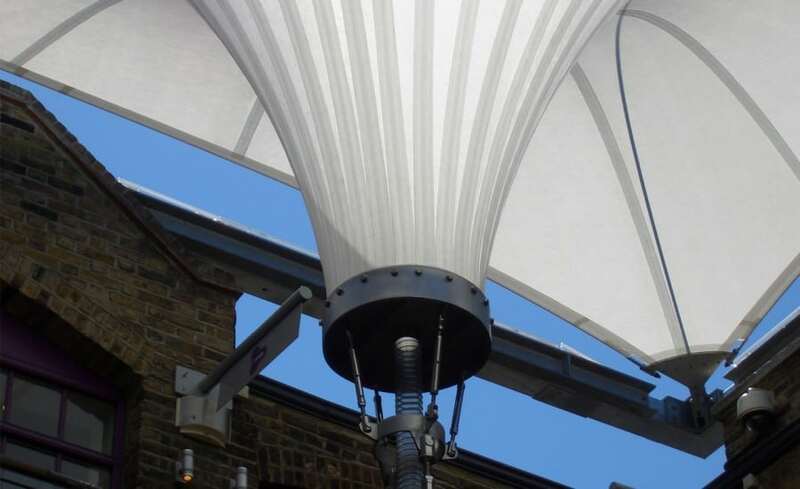 The provision of a tensile fabric canopy enclosing a listed courtyard off Carnaby Street in the heart of London.Designed by MRP Architects for their property owning clients, the intension of the event canopy is to provide short term temporary cover for events such a fashion shows within the courtyard with some protection from the vagaries of the British weather. 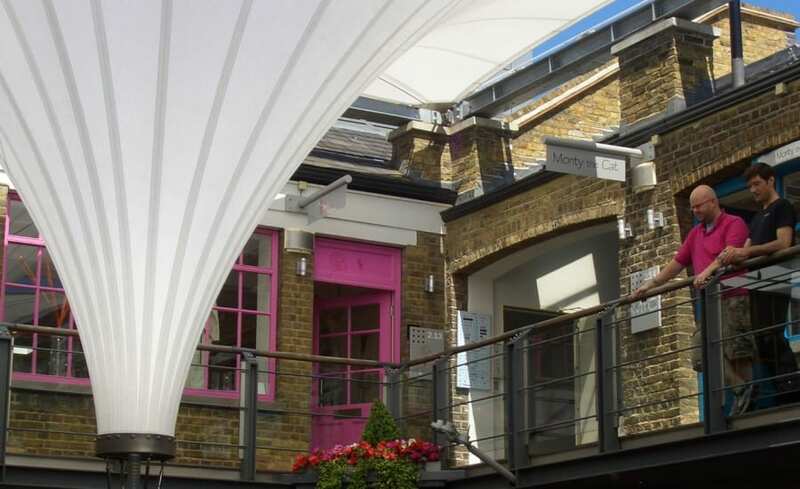 The brief at Kingly Court was for a stylish temporary structure that would provide the perfect backdrop for events, and yet provide sheltered from the changeable British weather. 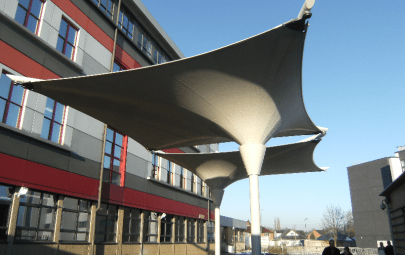 Not only was there a real need to quickly transpose, install and remove the canopies at short notice but it was also vital to ensure as much of the canopy and ancillary structural components as possible could be removed to comply with stringent planning requirements. 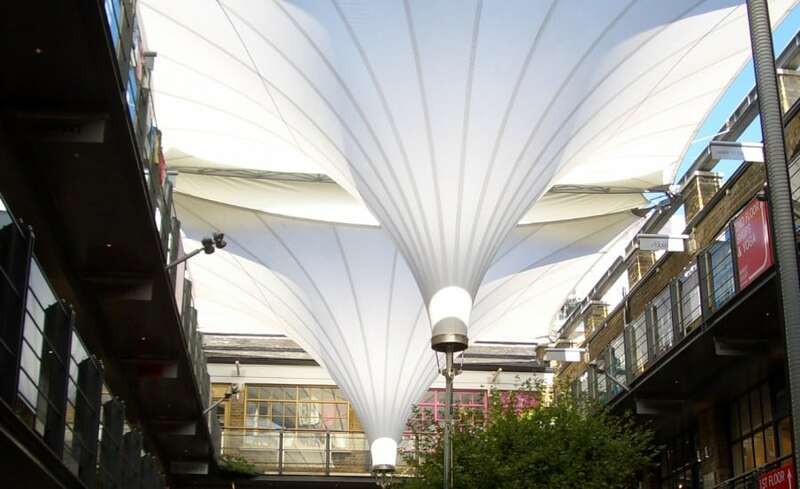 The stunning structure, made of Gore Tenara, comprises three inverted fabric cones, protecting the vast majority of the courtyard below from the weather. The shape of the cones insisted that some kind of drainage was installed, so Architen Landrell suggested a design to collect and channel rainwater to central down pipes, keeping it out of the way of the shoppers below. 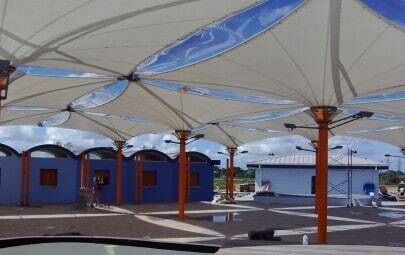 Fabricated using high translucency Gore Tenara membranes, the cones were flexible enough for continual installation and removal whilst still retaining full strength and an appealing aesthetic as well as forming a shade structure. The overall result has been well received by client and end users. 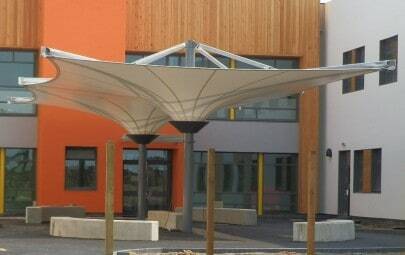 When installed the teflon canopies dramatically change courtyard and enhance the perception of the space as an events area without greatly reducing light levels or giving rise to feelings confinement.